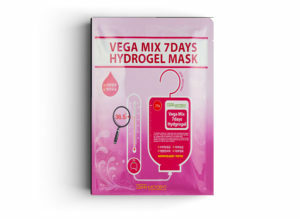 This Skin Factory Vega Mix 7 Day Hydrogel Mask is a unique two-piece mask that delivers a temperature-sensitive formula that slowly melts once it comes into contact with skin. The hydrogel material provides adhesion and increased moisture and nutrient composition to the entire face area. It also contains hydrolyzed collagen that helps to smoothen and firm skin. Vitamin E derivative helps skin to be more clear and radiant. Recommended usage is daily for 7 days to see the difference.